Internet clampdown – convenient distraction from political turmoil? There was unforeseen result in the United Kingdom general election. The Conservative Party was expected to increase their majority in government. However, it failed to achieve a majority and was forced to seek an alliance with the controversial Democratic Unionist Party (DUP) in order to form a government. 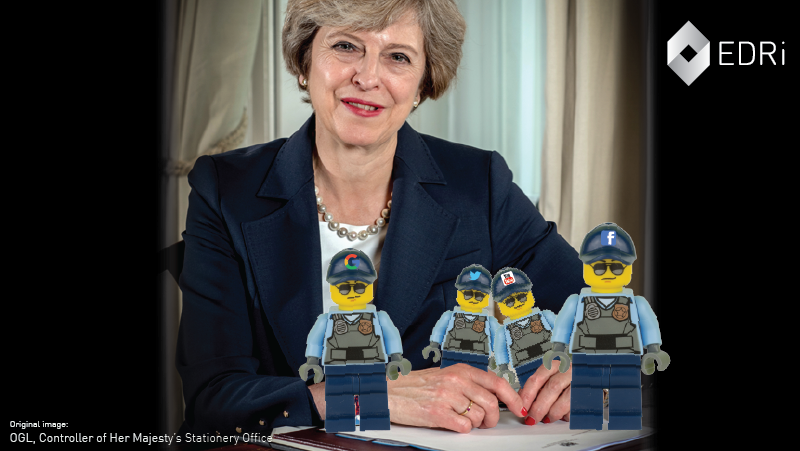 Despite this, Prime Minister Theresa May has hinted that she will push ahead with plans to clamp down on the internet. The Conservative Party manifesto included proposals that would force internet companies to be more proactive in removing user-generated content from their sites. This would undoubtedly mean the automated, algorithmic censorship of the internet without oversight. She is also likely to push through powers that could see companies forced to weaken the security of their products, especially to limit encryption. On 13 June, the UK government issued a press release announcing a joint campaign with France to tackle online radicalisation. The press release states that the two countries will explore the possibility of creating a new legal liability for tech companies if they fail to remove content, which could lead into tightening actions against tech companies who fail to remove unacceptable content. Prime Minister May and French President Emmanuel Macron also indicated that they will make proposals to press for establishing an industry-led forum to develop solutions to tackle terrorist content on the internet. It remains to be seen whether Prime Minister May will be successful, given how weak her position looks at the moment. But focusing on internet regulation could be a convenient distraction from political turmoil and impending Brexit negotiations.